Thank you to Alan Quinn and the Needlebar Group for making the survey possible, as well as for their ongoing sewing machine research that so greatly benefits all of us with an interest in these old machines. 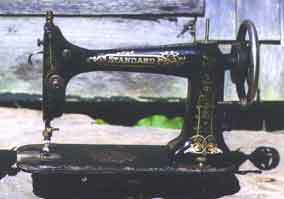 One of the most fascinating aspects of Standard Rotary sewing machines made by the Standard Sewing Machine Co. is that some of them will take an attachment called a chainstitch spider which installs in place of the bobbin case and (used along with a special chainstitch needle plate) converts the machine from straight stitch to single thread chainstitch. The spider that came with my Standard Rotary serial number 770155 worked well in that machine and one with a later serial number, but it would not fit it into any of my machines with a lower serial number. In doing this survey, I was hoping to find out whether there was a version of the chainstitch spider that would fit the earlier Standard Rotary machines. The earliest serial number for a machine in the survey that was confirmed to have a spider is 727368. Whether there is a version of the spider that will fit Standard Rotary machines with a serial number lower than 700000 remains to be discovered. The earliest machine in the survey has serial number 62565. 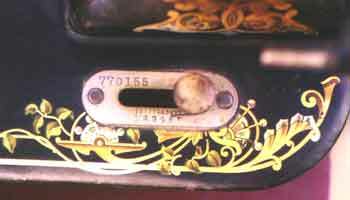 Machines with serial numbers lower than 174193 have the serial number on the flip-up plate (Photo 1). 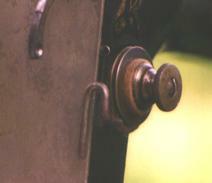 Machines with serial numbers above 182514 have the serial number on the stitch length plate (Photo 2). This serial number division also signifies a general change from the springless felt and grooved disk tension assembly (Photo 3) to the tension assembly with a spring and and a takeup spring with one free end (Photo 4). Two machines earlier than 174193 are reported as having the J tension assembly; perhaps the tension assembly was replaced with a later version sometime during their working lives. Photo 1. 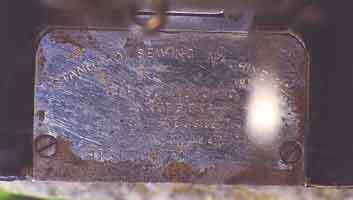 Serial number on edge of flip-up plate. Photo 2. Serial number on stitch length plate. Photo 3. Tension assembly made up of grooved disk and felt pads, no spring ("I" in the table of survey results). Photo 4. 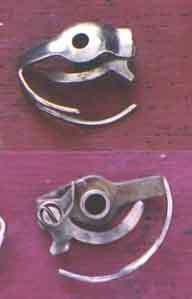 Tension assembly with spring and takeup spring having one free end ("J" in the table of survey results). Another major division in the serial numbers occurs between 1065155 which is the latest reported "slim" machine (5) and 1247790 which is the earliest reported "stout" machine (6). 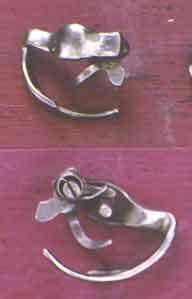 This change in shape corresponds with another change in the tension assembly to one including a takeup spring with no free end (7). Photo 7. Tension assembly with spring and the takeup spring has no free end--found only on "stout" shape ("K" in the table of survey results). In addition, the shape change signifies a change in the shuttle race from a hollow pin to a solid pin. Therefore, stout machines require a spider with a hollow pin, and slim machines of approximate serial number 700,000 and above require a spider with a solid pin. Photo 8. Front and back of spider with solid pin, which fits "slim" machines having serial numbers above about 700,000. Photo 9. Front and back of spider with hollow pin, which fits "stout" machines at least between 1247790 and 1362800, and possibly above. The 4 feed dog variants (Photos 10, 11, 12, 12) do not seem to be perfectly correlated with any particular serial number sets except that versions 1 and 2 are found only on "slim" machines and version 4 is found only on "stout" machines. 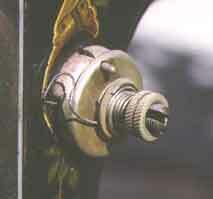 Note the slight difference in configuration between versions 3 and 4: on version 3, the leg of the L-shaped feed extends only to the front edge of the needle hole; on version 4, the leg extends well beyond the front edge of the needle hole. Photo 10. Feed dogs version 1. Photo 11. Feed dogs version 2. Photo 12. Feed dogs version 3. Photo 13. Feed dogs version 4. The two known variants of the common leafy vine decal, "multi" (Photo 14) and "brown/gold" (Photo 15), are both found on quite early "slim" machines as well as much later "stout" machines. 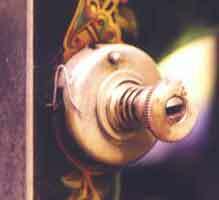 One person reported a confirmed Standard Rotary machine with completely different decals, a gold art deco pattern with the famous winged bobbin decal on the bed. A few others reported decals that were not the basic leafy vine decal, but of those, none were confirmed as being Standard Rotary machines made by the Standard Sewing Machine Co.
Photo 14. Leafy vine decal variant "multi". Photo 15. Leafy vine decal variant "brown and gold"
One of the difficulties of this survey was that there was a very nice number of responses (over 100), but unfortunately the majority did not actually have rotary machines of the target group, i.e. 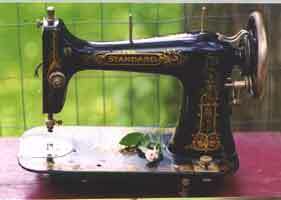 those made by the Standard Sewing Machine Co. I apologize for not realizing that there would be confusion about that, and I am very grateful for all responses, even those which I could not use.